The younger the attention span, the more likely it is to be grabbed by advertising on social media, a new study shows. Members of Generation Y are most likely to click on an ad placed onsocial media, with 57 per cent of them saying they’ve done so in thepast, according to a survey by Ipsos Open Thinking Exchange and IpsosGlobal @dvisor. 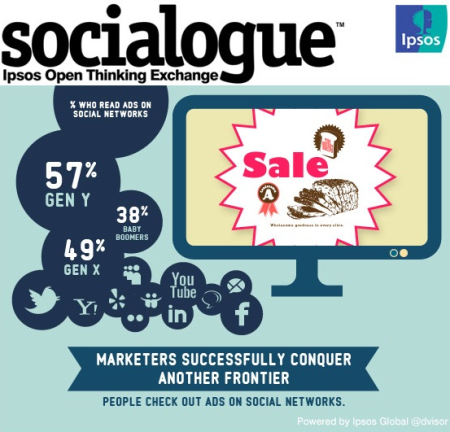 Ipsos infographic shows the clickthrough rates for ads on social media among certain demographic groups. Only 49 per cent of Generation X respondents have bothered to read adson social media sites. Social media advertising is least effective onolder users: just 38 per cent of Baby Boomers have clicked on a socialmedia advert. The same pattern can be seen with ads on mobile phones: 45 per cent ofGen Y users clicked on them compared to 43 per cent of Gen Xers and 35per cent of Boomers. Although the same youth-based trend is seen with ads on mobile phones,it does appear that phone-based ads are less effective than socialmedia ads overall. Mobile phone ads grabbed the attention of only 30per cent within Gen Y, 31 per cent within Gen X and 25 per cent of BabyBoomers.